It can be argued that Raiders quarterback Derek Carr didn’t deserve to play in this year’s Pro Bowl. Carr took a step back in 2017 after a stellar 2016 as the team fell from 12-4 to 6-10. But now that Carr is at the Pro Bowl (as a fill-in for Tom Brady), practicing for this weekend’s game, he’s putting on a show and letting those around the league know he has the skills to get back on track in 2018 under new head coach Jon Gruden. Carr, at his third straight Pro Bowl, was terrific in the Precision Passing Challenge, a passing contest between several QBs in the game. 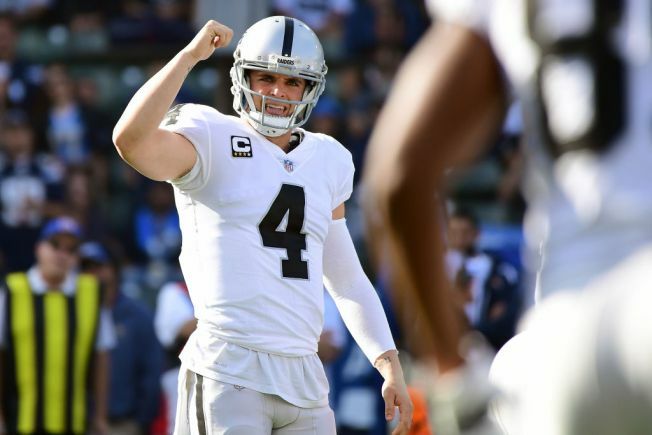 Carr beat Jared Goff of the Rams and Russell Wilson of the Seahawks and set a record for most points scored in the event, which challenges passers to hit a series of targets while being timed. Also this week, some of the AFC’s top receivers in the game have been talking about what a terrific passer he is. In one practice this week, Carr connected with the Steelers’ Antonio Brown on a 70-yard pass play. Jarvis Landry of the Dolphins and Tyreek Hill of the Chiefs also said Carr has been throwing the ball well in practices. The Pro Bowl is set for Sunday at noon (Pacific time) at Camping World Stadium in Orlando, Fla.